The largest ski resort in the canton GraubÜnden, connecting 3 villages – Laax, Flims and Falera, with 235 kilometres of pistes, offers you Europe’s largest halfpipe and first indoor freestyle base with a wide range of restaurants on the mountain and in the valley, all kinds of events and concerts. Be sure, that’s all will satisfy every need! LAAX has truly become a synonym of a young and dynamic way of life. LAAX is the paradise for freestylers and families. And there is no surprise. The Head of Marketing and Communication of Laax Katja Kamps will tell us about this wonderful place. – Katja, could you tell a little about location and history of the resort, its peculiarities? LAAX is with 235 kilometers of slopes and an area of 100 square meters is one of the largest ski resort in the canton GraubÜnden. It connects three villages: Flims (1’100 meters), Laax (1’100 meters), and Falera (1’220 meters). Tourism started in the region in 1875, as the people of towns like Zurich visited the region for the summer freshness. Winter tourism took place 1930 when Flims founded the first ski school in Switzerland and then in 1945 built the first chairlift of its kind in Europa. In 1962 the touristic development of Laax took off with the first railway going up from Laax valley station to Crap Sogn Gion (2’228 meters). Today Crap Sogn Gion is the center of the ski resort – here the four snow parks for the freestylers and a great area especially aligned for beginners. Freestyle has a long tradition in LAAX. When snowboarding became popular as a new sport around 1980, most of the ski resorts rejected this new generation of winter sport enthusiasts. But not LAAX – on the contrary, it welcomed the snowboarders and built half pipes and snow parks for them. LAAX was also the birthplace of the Pipe Monster, the machine that shapes the half pipes all over the world and set its height by 6,8 meters, today’s Olympic standard. LAAX invested over the years a lot in the infrastructure and also in the know-how and the competence and became «The Freestyle Mekka of Europe». International events like the 6star TTR Burton European Open and the European Freeski Open take place every year in LAAX. – What are the sights, which the guests can see there? Today you find in LAAX a state of the art infrastructure, a great gastronomy and top service. But you will also be impressed by the great nature the region has to offer. An interesting fact about LAAX is that you can ski from 1100 till 3018 meters. On top there is the Vorab Glacier. Another remarkable sight is the Sardona UNESCO World Heritage Site with the «TschingelhÖrner». – What are the peculiarities of skiing at the resort? LAAX is the paradise for freestylers and families. In total there are four snow parks, for all kind of level. Since 2014 LAAX offers the world’s largest halfpipe and since December 2013 there is a new pro-kicker-line in Snowpark Curnius, That makes LAAX the perfect place to train for the pros. But also beginners can make their first steps in the Beginner Park or the minipipe. Then there is the Freestyle Academy, where freestylers can train and learn new tricks safely. It is the first freestyle indoor base of its kind in Europe. On an area of 1000 sqm you find a trampoline area, an air track, two snow flex and one wood kicker with a soft landing in the foam pit, a snow flex practice area and also a skate mini ramp, a skate street area and a skate bowl. To sum it up: The Freestyle Academy is a unique freestyle paradise, where people of all kind, level and age can have fun and learn new tricks safely. The combination of the Freestyle Academy and the snow parks as well as the concept of the ski and snowboard schools highlights again the freestyle competence of LAAX, which makes this destination so unique. And also for families with young children and for beginners stay in the center of LAAX. Directly in the ski area there is an extra beginner’s area including a beginner snow park. The slopes are wide and easy and lead to chairlifts, which also meet the needs of beginners. At the lifts, all moving carpets and barriers have been removed. And in the stations, the lift slows significantly down in order to make boarding and exit as stress-free as possible. But there are even more attractions for families. Children aged four and over can experience their own fairytale world in the snow wonderland – with the wizard, Ami Sabi, the friend of the forest and the animals. The three snow wonderlands – right by the valley stations of Flims, Laax and Falera – offer kids unique experiences, with a whole new type of skiing lessons orientated specifically to the needs of the children. – You said, that Laax is considered to be «The Freestyle Mekka of Europe». Tell us, are there general or off-piste skiing areas? 40 kilometers out of the total 235 kilometers of slopes are secured and marked but not prepared ski runs, where skiers and snowboarders can enjoy fresh powder. – What’s the most attractive accommodation for young people? Riders Palace is definitively the place to be. With its roots in the snowboard and music scene, the Riders Palace has established itself as popular home base to young freestylers. Directly located at base station Laax, the Riders Palace is an excellent starting point to discover LAAX. Suitable for any budget the Riders Palace offers simple shared rooms to multimedia suites. Beyond Switzerland, the Riders Palace is also a well-known party place. It welcomes top international acts and newcomers on stage every season and also in the lobby bar legendary DJ-Partys and small but fine live acts take place. – What does LAAX offer for young people? Young people fall in love with Laax. It is young, dynamic and modern. Nowhere else you find such a package of perfect snow park infrastructure, a freestyle paradise like the Freestyle Academy, a bunch of cool bars and clubs to hang out and great people. – Speaking of family holidays. What’s the most attractive accommodation for families? The absolute highlight for families is the stylish Rocksresort right by the valley station in Laax. It represents the modern Alpine lifestyle with impressive architecture. Thanks to its comfortable location, it's easy to get there. Superb restaurants, an attractive range of shops, the Freestyle Academy and the snow wonderland are all nearby. Family holidays in the snow are a guaranteed hit at LAAX, with no other place in the Alpine region offering such a great hassle-free all-round service. The latest skis and snowboards can be rented for the whole family from the five rental shops and the LAAX ski school offers skiing courses for every level and age. And you can happily leave small children to be looked after at our crÈche until the evening. The highlights for families are the Ami Sabi, the Freestyle Academy, the Rocksresort in combination with a modern ski resort and great variety of gastronomy. LAAX offers the full care free package for families, and the guarantee that all family members can enjoy unforgettable winter holidays. – Of course, the resort offers a wide range of skiing courses and snowboard schools. What basic skills and new trends can your ski and snowboard schools teach children and adults? With freestyle as the basic concept throughout the entire ski resort it is also a major part of the ski and snowboard school. Therefore right from the beginning the classes will visit the snow parks to approach them slowly. And also the basic of the freeriding is part of the ski and snowboard school classes at an early stage. Furthermore the ski and snowboard school offers special beginner packages, called LAAX for Beginners. It is intended for anyone who simply wants to try out snowboarding or skiing for the first time. You can learn the basic principles and have fun on the slopes right from the start. As well as professional tuition, the four-hour beginners' course includes a day lift ticket, equipment hire and lunch together on the mountain. – What is the best time to start skiing and visiting the resort? How long is a ski season here? Depending on the weather and snow conditions we can start with the glacier season already at the end of October. From then on people can ski on the glacier and as soon as possible more lifts are going to be opened. From the middle of December, around Christmas, until the end of March, lasts the main season. During this period the entire ski resort is fully operated. After that the spring season starts till around middle of April, with limited lift and slope operations, depending on weather and snow conditions. Thanks to the weather influence of the south LAAX belongs to one of the sunniest destination in the region. – Suppose, everybody wants to know what’s the guarantee of snow cover in the resort? As more than 70% of the slopes are located over 2000 meters we can ensure great snow quality and security during the entire season. Plus 45% of the ski resort including four valley runs being covered by technical snowing, we can guarantee snow, even in winters with less snow. – If your guests want to visit some social and sports events or festivals what will you offer them? During the entire season plenty of minor events of different kinds take place. But one of the highlights are definitively the internationally well-known Burton European Open Championships. Since more then ten years this event is being held in LAAX and organizers, sponsors, competitors and visitors are always very excited to see the world class snowboarders showing their skills in our snow parks. And of course it also encourages us, if one of the most important snowboard contests of Europe is held here in LAAX. In 2014 another important freestyle event took place – The European Freeski Open. Although it was already the 7th edition of the event, it still contains a lot of potential to develop. By organizing and hosting this international high level event, we are happy to contribute towards a positive development of freeskiing. The major percentage of guests is from the German speaking part of Switzerland and Germany. But we also attract guests from the Netherlands, Belgium, Luxembourg, the UK, Poland, Russia and the Scandinavian countries. – How your guests can reach the resort the best and the fastest way? Our guests can make use of the LAAX airport shuttle service with pick up directly at the airports of Zurich, Memmingen, Friedrichshafen and Innsbruck. The service can be booked directly at laax.com. The resort is also well connected by public transport and thanks to the efficient railway services in Switzerland this is also very fast and convenient. – Are there facilities for ending up exhausting and full of emotions day? LAAX has a great variety of bars and sun terraces on the mountain as well as at the valley stations. In contrast to what is well-known of aprÈs ski in Austria we rather prefer to offer a more relaxed way to round off a wonderful day on the mountain. And our guests appreciate to have the choice of all different kinds of locations, for example there is the stylish Crapbar, where DJs often play some urban sound, or the hip Indy Bar, where the young crowd meets for drinks after riding, others prefer the lively pub atmosphere at Il Pup, or the tasteful wine bar at Grandis. – Are there any special offers for some categories of tourists and for ski-pass purchase? In general there are different price categories for children, young people and adults. And also large groups and seniors get a special discount. Also we offer special deals for families including grandparents on certain dates. On top of that our guests have the chance to buy their tickets over LAAX+ to a very attractive price the entire season. LAAX+ (www.plus.laax.com) is a special online shop, where our guests can select a ticket from different categories: ECO, STANDARD or BLUELINE. In the category «ECO» the prices are dynamic, which means they vary every day, depending on season, weather, and snow conditions. It is similar to the pricing system the airlines use. So mainly you can say, the earlier you book the lower the prices are in this category. In the second category, called «BLUELINE», you can choose a lift ticket with an extra service, like a reserved parking lot at the valley station as well as the access to an extra fast-line at the lifts in the ski resort. We like to offer this special service our guests which like to pay extra money for extra services. In the category «STANDARD» guests can simply buy their lift ticket online to the standard price. Because the convenience of LAAX+ is its easy handling and that you can buy the ticket the day before and the next morning you head straight to the mountain. Since 2014 we can offer our guests also the ECO+ ticket, which offers lift ticket plus ski or snowboard rental. – What innovations and surprises can be expected from lift stations? LAAX is well-known among the industry for its innovations and for being a first mover. 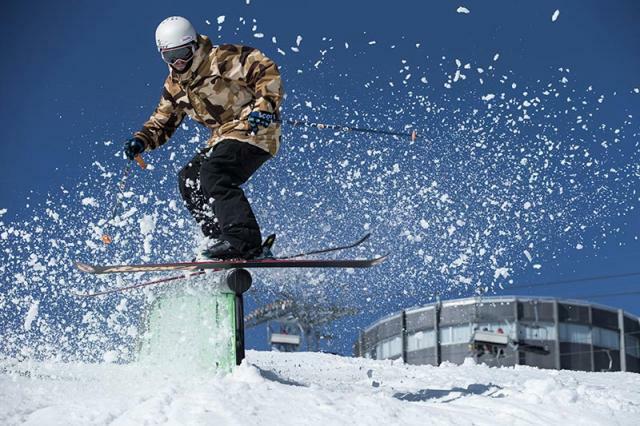 There are plenty of examples for that like the Freestyle Academy, the Rocksresort or also LAAX+. Another great innovation is the 6-seater chairlift Lavadinas which has been designed by Porsche Design Studios. Together with the manufacturer Bartholet Maschinenbau Flums AG we realized the idea of a turning chairlift. In December 2012 we could set this idea into reality when we opened the first chairlift that turns by 45 degrees when leaving the station and makes it possible to our guests to enjoy the beautiful panoramic view in the mountains instead of their foreman. The lift is a novelty and stands out also thanks to its unique design.